Today the family took a trip to Grandma's house even though Grandma wasn't there. Grandma took a train trip for the weekend to see some friends of the family. We took the trip out there because I had a few bits of maintenance to tend to. 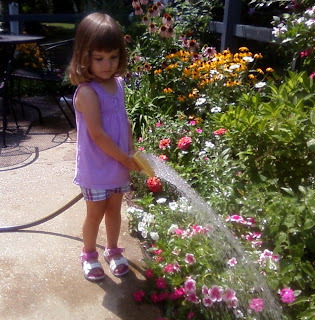 After the work on the driveway was finished Alyce and I watered Grandma's flowers. 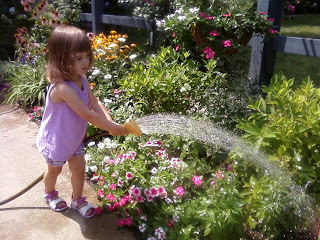 Well Alyce did most of the watering with my supervision. She did a pretty good job however she got a little drenched in the process. Nothing that 20 minutes in the drying wouldn't fix (the clothes, not Alyce). We also used the opportunity to meet up with our friends Josh, Tammy, and their son (Alyce's boyfriend) Gideon. They are stuck out in my hometown with Tammy's parents while they are waiting to close on their house. 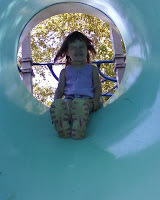 We met them at the local lake and park for some fun. 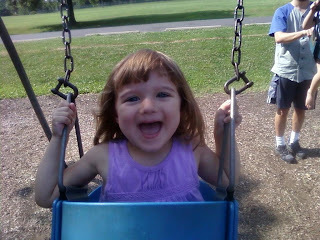 One thing really cool that happened was that Alyce swung on a swing for the first time ever while at the park. We've tried to get her on the swing many times in the past but Alyce always started crying before we could ever get started. Of course once we got her on the swing she loved every minute of it and didn't want to get off. 0 comments on "Alyce is Helping Grandma"